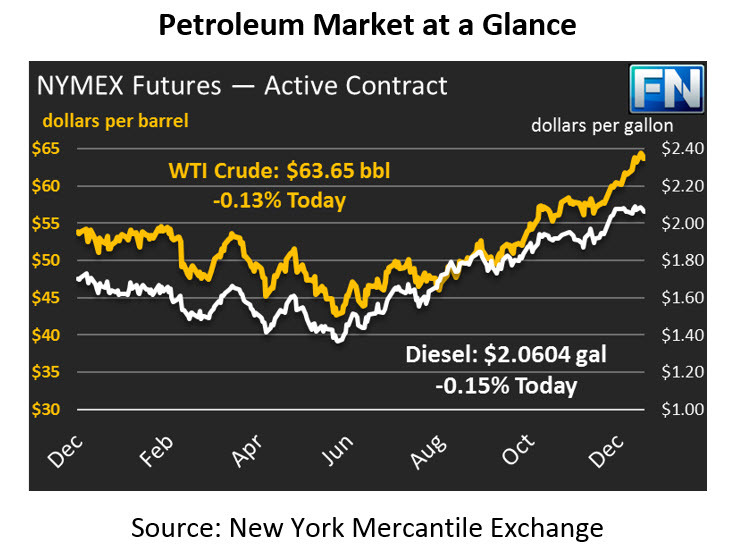 Oil markets lost ground yesterday, led lower by falling diesel prices. Crude gave up a bit over 1% yesterday, closing at $63.73. Today, prices have been flat, searching for a direction ahead of this afternoon’s API report. Crude prices are trading at $63.65, a loss of 8 cents. Diesel fuel has been leading the complex lower, shedding 2.8 cents (-1.3%) yesterday. The loss is surprising given the cold snap travelling east through the country – cold weather typically brings power outages and strong heating demand, requiring diesel fuel to supplement waning natural gas supplies. But cold weather had already been baked into diesel’s extremely high prices, and traders couldn’t justify any moves higher. Today, diesel prices are continuing their move lower, shedding 0.3 cents to trade at $2.0604. Gasoline has performed relatively strongly, losing just 1.2 cents (-0.6%) yesterday and in positive territory today. Gasoline prices are trading at $1.8472 right now, an increase of 0.9 cents (0.5%). Yesterday, several analysts from major banks began hinting at the possibility of the OPEC deal unwinding well before the December expiration. With Brent crude prices near $70, member countries will inevitably start to feel like they’ve accomplished what they set out to do. The CEO of Russian oil major Lukoil noted that Russia should exit the deal if prices remain near $70 during the first half of the year. It’s interesting that OPEC exit sentiment comes against the background of the EIA forecasting a net surplus of supply for the first half of 2018. OPEC believes markets are nearly balanced, and inventories are certainly far lower than they were two years ago. These factors make it even more important for OPEC to plan an exit strategy. If they maintain cuts too long, they may allow U.S. producers to swoop in and steal market share; too short, and prices could collapse once again to the $40s.